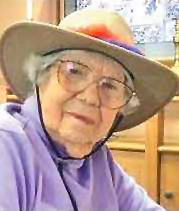 passed away on November 28, 2017 at the age of 105. Born on October 21, 1912. She was predeceased by both husbands, George Dudley, Earl and daughter Helen Schneider. She left behind daughter Audrey, son Jon, son-in-law Paul Schneider, seven grandchildren, eight great-grand- children, nieces and nephews. In lieu of flowers, please consider donations to her favorite organizations. (1) Whitman college's George Dudley and Lois Dusenbery Scholarship Endowment. Checks made payable to Whitman. Addressed to John Bogley, Development Office Whitman College, Walla Walla, Wa. 98362. (2) Wellsprings Family Services, 1900 Rainier Ave. S., 98144 (3) Family Programs Hawaii, Ho'omalu O Na Kamali'i, 801 South King St., Honolulu, HI 96814, Attn: Holly Hood. (4) St. Monica Catholic Church, Scholarship Fund, 4311 88th Ave. SE, Mercer Isl. WA, 98040.